3 Amazing Thrift Hauls at the Value Village, Unique Thrift, and the ReStore! You are here: Home / Thrift Talk / 3 Amazing Thrift Hauls at the Value Village, Unique Thrift, and the ReStore! It’s been a while since I’ve done a proper thrift haul, but don’t think I haven’t been stopping through the thrift store, especially on their 50% off holiday sales for Memorial Day and 4th of July! I haven’t been buying as much furniture because….well….I just don’t have as much space for it anymore! But I love when I’m doing a room makeover because that gives me “permission” to find some awesome stuff for the room! I’ve been working on my sons’ bedroom, which means I’ve been on the prowl for good deals! 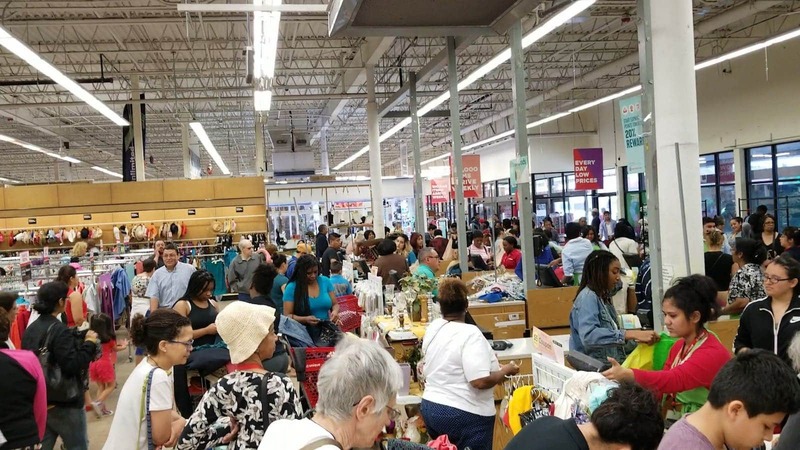 It never ceases to amaze me how crowded Value Village and Unique Thrift become on 50% off days. It’s insane, like Black Friday! If you don’t get there early, all the good deals are gone, cleaned out faster than the Grinch Stole Christmas. HA! 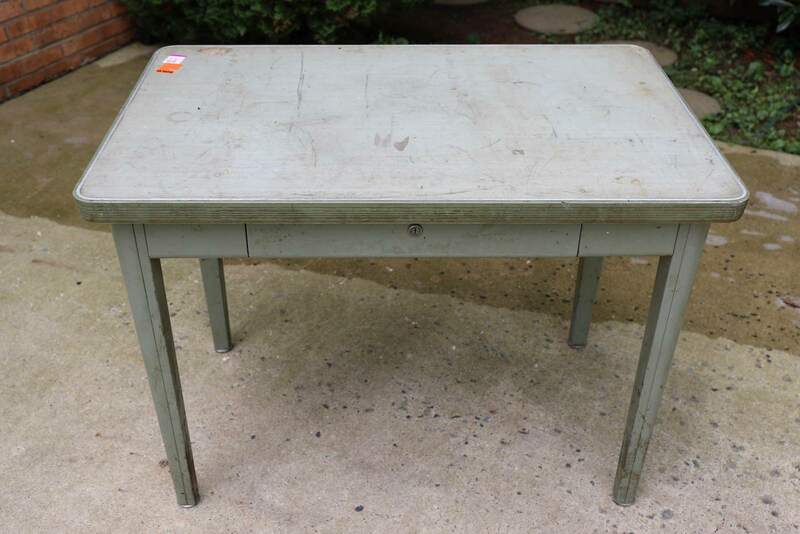 One of those 50% off sales days, I saw this dirty desk. Size-wise, it was perfect for what my sons’ room makeover: not too big….not too small. Just right, like Goldilocks and the Three Bears. LOL. But it was one of those days where I was on the hunt for a dresser, not a desk, and to think of lugging this dirty piece of furniture into the back of my minivan was such a turnoff. I simply walked away and told myself that if it was meant for me, it would be there later for me. Fast-forward a week later and I’m having lunch with my friend Thrift Store Pete. Pete refinishes thrift store furniture, as well, but he favors mid-century modern pieces, and as of late, he loves refinishing metal! So I was telling him about this “ugly metal table I saw last week at the thrift store.” Pete tells me that the table is still there! Since he goes to the thrift store every day (yes, literally every day, scouring them for pieces to refinish), he had seen it there just that morning. He urged me to go get it, but since the Haven Conference was the following day, I forgot about the table in all my hustle and bustle to catch my flight the next morning. A few days later, while lying in bed one morning at the conference, the desk crossed my mind, “Shoot! I forgot to get that desk!” I texted Pete, asking him to grab the desk for me if he sees it, which he thought it was gone. But thankfully, the following morning I got a text from Pete showing me that he had bought the desk for me and that I can pick it up when I return from my conference! Woohoo! A Handmade Storage Chest From the Thrift Store! I also recently found this amazing storage chest! Last summer I had won a Savers Thrift Store “Reuse and Recycle” content (they loved how I turned my son’s toddler bed into a potting bench!). I won a whopping $200 gift card to Savers, which works at any of the Unique Thrift and Value Village Stores. Well, one day I stopped in to see what they had and I saw this sturdy, solid oak storage chest sitting there, waiting for me! At $40, it was a little more pricey than I wanted to pay out of pocket, but with that $200 gift card, I got it for “free”! Apparently, they have just put the storage chest out on the floor. As I carried it to the front, my fellow thrift store admirers kept complimenting me on such a great find. It was in pristine condition on the inside (is that a cedar OSB bottom??). The outside looked like it just needed some sanding down. No paint will touch this gorgeous solid oak! I didn’t know what I would do with it, but it was too good of a quality piece of handmade furniture to leave it there for the next person. And wouldn’t you know that after lugging this home, I realized that it would be an amazing storage box for my sons’ room! This was a recent find that I literally couldn’t walk away from! I had stopped into the ReStore to peek around for a dresser for my sons’ room makeover. 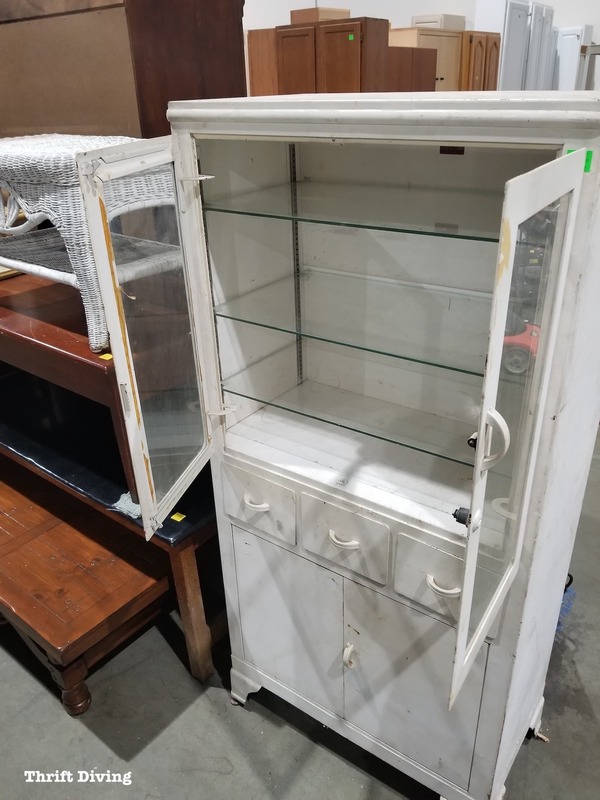 Finding nothing, I turned to leave and this beauty caught my eye: a vintage medicine cabinet!! After a series of texts back and forth about how much I love it, Pete promised to stop by the following morning to check it out to see if it would be worth him buying it. He and I have been wanting to team up on a project together and I thought this would be perfect. I’ll admit that the thought of buying used shoes from the thrift store is a very icky thought. What about you–do you buy shoes from the thrift store? I’ve never had much luck finding much in the way of shoes at the thrift store, but the recent 50% off holiday sales proved to be a very successful shoe thrift haul for me! Wearing size 10 shoes means that other Big Foot Amazonian women like myself usually beat me to the shoes, but on this particular day, I made out like a bandit! All of these shoes were name brands and ranged from $60 – $150 retail! I walked away paying $3.00 for sandals! But you should have seen me when I got back to my car…. After trying on nasty thrift store shoes, I doused my bare feet in water from my cup, scrubbed them down with scattered napkins from a take-out restaurant, and vowed to always carry rubbing alcohol pads in my pocket when shoe-diving at the thrift store. HA! A Few Other Fun Things at the Thrift Store! I’m not a “dog” person, but if I were, especially a pug and chihuahua lover, these fun prints would have had to come home with me. They’re adorable!! I don’t recall how much they were, though. Looking at them now makes me wish I would have bought them. They were a lot of fun and colorful, too. And I actually tried to Google this Linda Chesnovsky person. I think she might be a 59-year-old woman in Philadelphia. 🙂 It’s not a common name, so I would bet that’s her. She would have been about 17-years-old at the time she drew this. I wonder who Dor was? (Don’t you love thinking about the people who’s things turn up in thrift stores??). 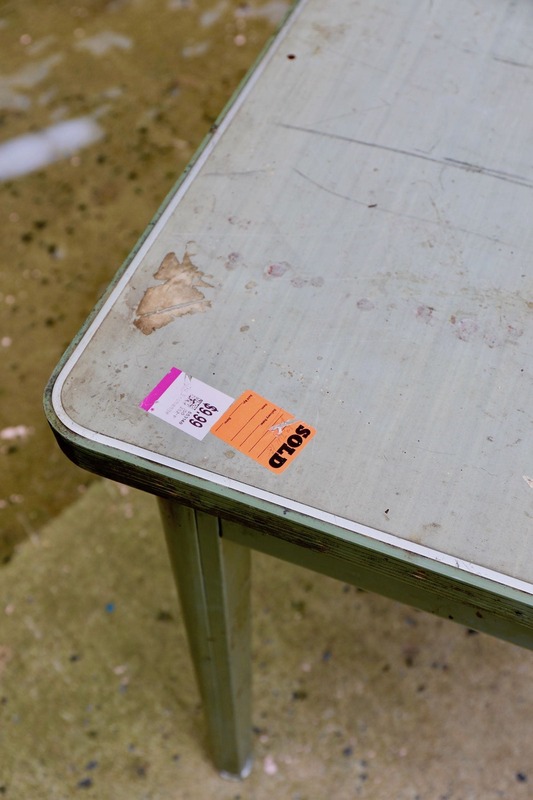 Soooo….have you found anything amazing at your favorite thrift store? Leave a comment below and tell me what you found! I definitely shop for used shoes at the thrift stores. I have size 10 feet (and wide ones at that), and find it nearly impossible to find NEW shoes that fit. Can’t tell you how many times I’ve dropped $200 on shoes that seemed to fit comfortably in the store, then pinched as soon as I started wearing them outside! At least thrift store shoes aren’t a huge financial loss… and weirdly, I tend to have better luck with them than new-bought shoes. Also, there seem to be some great-footed ladies in my city who have great taste in shoes — my last few scores have been fantastic. If I had better luck at the shoe store I might feel differently, but I say: thank God for thrift stores with a wide selection of shoes that include decent options for big-footed women like me!! I love a good old thrift store haul post! I visited some thrift stores in our tiny vacation town and found so many goodies I wanted to buy. I settled for only buying two cute brass quails. I’m excited to see the medicine cabinet rehab. I must have missed a post on your collaboration. I know it will be interesting no matter what you do. I’ve often sifted through post cards in vintage shops and wonder about the sender? It’s a little snapshot of history, lost to us. 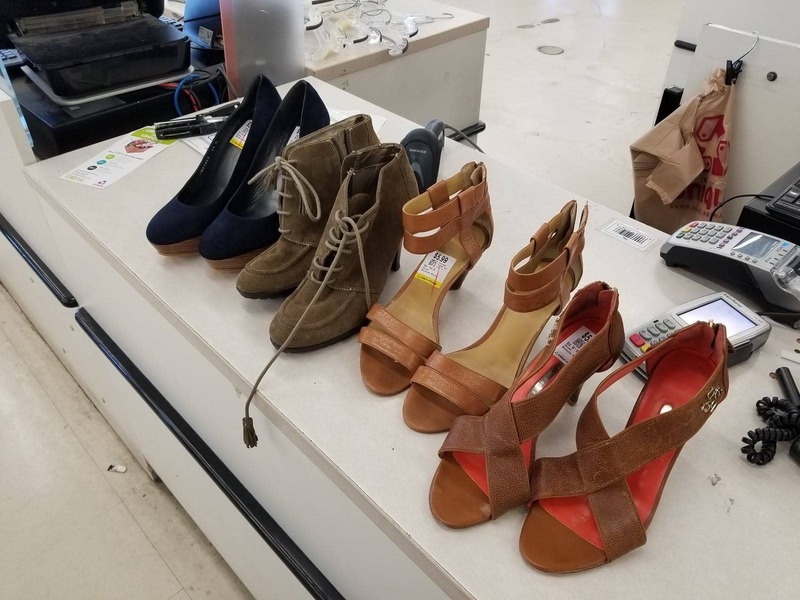 I’ve been volunteering at a drop-in center for homeless women this summer, so my favorite thrift store finds lately are serviceable, well-priced, comfortable shoes, summer dresses and tank tops, all in demand right now. We serve 30 women a day at the boutique, three times a week. I only buy if the shoes are in really good shape. Dresses have to be cotton as it is too hot for anything else. I love your posts, here and on Facebook, and miss them when life gets busy. I hope you’ve had a full recover from your surgery. The medicine cabinet will be great! 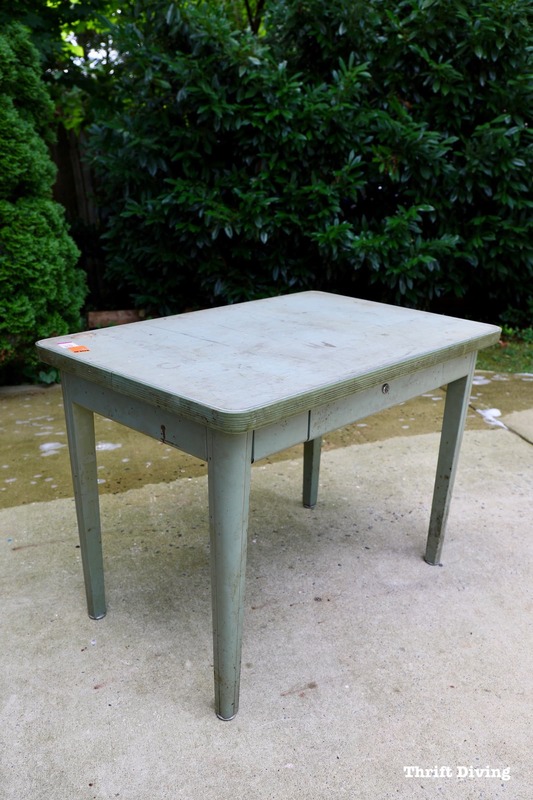 I adore “Thrift Store Pete” and I love what he does with his refinished pieces. He and I are meeting up for lunch this week so we’ll discuss this collaboration on this cabinet. Hopefully we will do it soon! That’s awesome you’ve been volunteering at a drop-in center! You are an inspiration. So you get to find all the nice things from the thrift store and buy them for the women who come by? Love that!!! Can’t wait for you to refinish the medicine cabinet. I have one that has been waiting to be refinished in my basement!!! Working on refinishing a corner cabinet with lots of paint. Just started, but surprise, the wood is probably walnut. It’s going to be beautiful when complete! Hey Abby! I’m hoping we’ll get to the cabinet soon. Pete and I are having lunch this week so I know we will talk about the “when” and “how” of the medicine cabinet. I can’t wait! 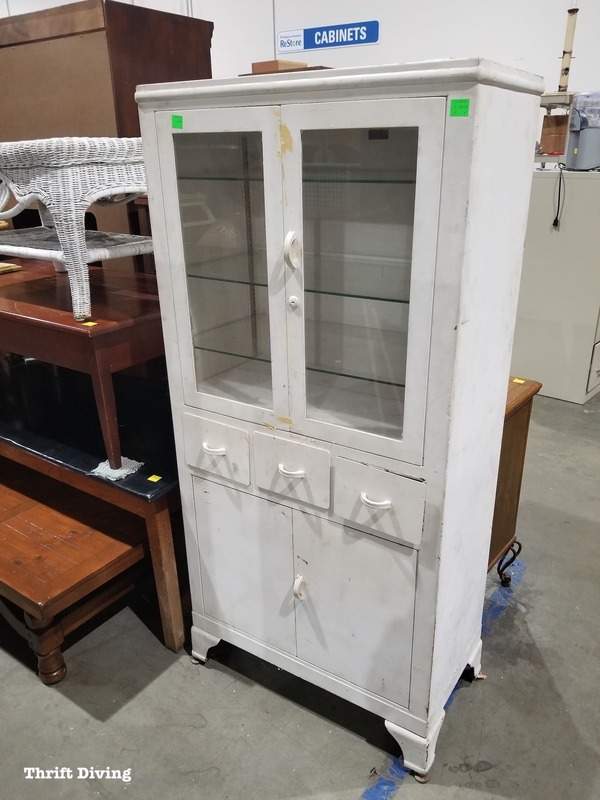 Looking forward to seeing your corner cabinet. Send me a pic when you’re done!